Many of us don’t like to use public transport for short distance! For them, a kick scooter can be the perfect choice to commute through school or even work. You may wonder, WHAT! A kick scooter for adults!! They are the toy for kids. But nowadays, kick scooters are designed also for adults so that they can easily ride to move around in short distance. That means you can easily go to your class or office riding a kick scooter and have fun. But it is a little bit tough to get the perfect scooter for an adult. You need to check many things before buying. 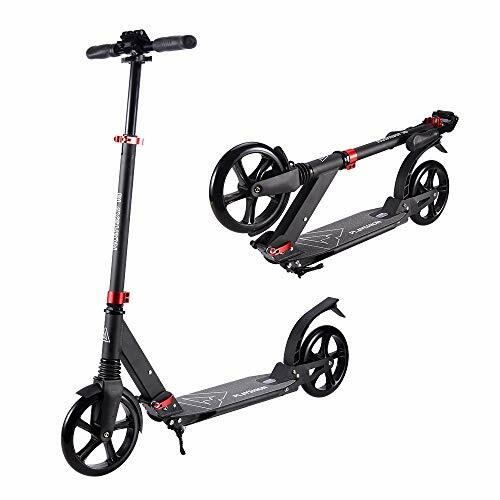 If you’re aware of the features of a good quality scooter, you can easily get one. But if you are buying one for the first time and literally don’t have any idea about them, you may get the wrong one. So it is always better to check out for the reviews and new features of scooter on the internet before buying. By this, you’ll get proper idea about it and can get the right one for you. Razor is probably the most used kick scooter so far. They are popular for providing quality sports accessories in an affordable range. Kick scooters for adults and teens are the new addition in their collection. These come with larger weight capacity and adjustable features so that it can be used by a wide range of users irrespective of their age and size. 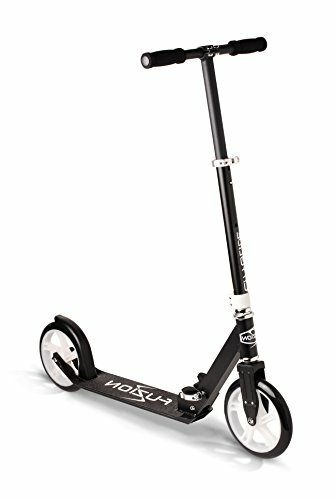 The A5 Lux scooter is durable due to its aircraft-grade aluminum t-tube, sturdy deck, and large urethane wheels. Folding, standing and storing this scooter can be done in a snap. It is a great and affordable go to ride for any teenager and young adults. The deck of this scooter is a bit small for people with big shoe size. Besides, it may not give a smooth ride as expected because most of the users experience a negligible rattling of the wheels. So, it is less suitable for riding on a rough surface on daily basis by mid-aged people. However, for youngsters, it is perfectly fine and must have a vehicle; can be a great gift for them on special occasions. The best thing is, you don’t need to break the bank to own this. As this scooter is widely used, hence some people disapprove this brand for their identical stickers on the scooter. Adding your own sticker of your choice may solve the problem and can make your scooter stand out from others. Easy to fold and space saving. Handlebars range: 33 inches to 43 inches. If you desperately need a kick scooter for years to come, then it will be wiser to invest in one that can withstand years of abuse. 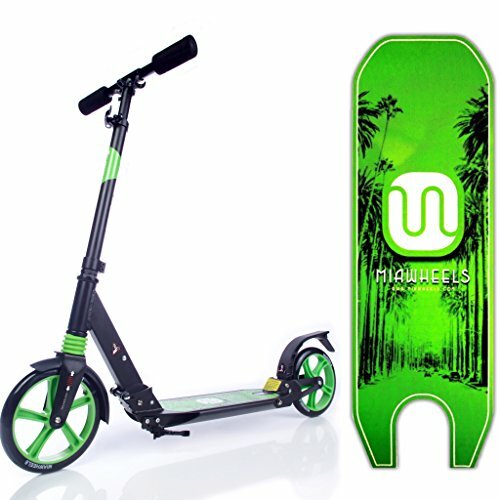 This scooter from Hudora is specially made for adults, with large feet. Its spacious deck and the large wheels will ensure every ride to be comfortable at its best. Handlebars range: 26 to 36 inches. For a gentle stroll to your work from home every day, a budget-friendly kick scooter should be enough to save your time and money and increase your productivity. With all these positivities, added safety is also offered by Fuzion CityGlide scooters of this model. The handle brake ensures extra safety to ride on busy roads or pedestrians when you are in hurry. This scooter comes in two different vibrant colors, that are meant to turn heads and make yourself outstanding. This one is midnight blue and another one is black; both come with cool geographic motifs on the deck. The deck size is quite small and so as the weight capacity. This scooter only suits people of medium height and weight. The height of the handlebar can be lifted from 26 inches to 36 inches. So, teenagers can use it even after growing a foot taller. As this is one of the economic kick scooters of our list, there are some shortcoming of this scooter. You have to purchase a strap separately for is. Besides, there is no kickstand with it. The good thing is, quality is not compromised while making this scooter, so, individuals on a tight budget can also experience the enjoyment of riding a kick scooter. Comes with handle brake for added safety. Does not have a kickstand. Handlebars range: 26 to 38 inches. Have you outgrown your old kick scooter? If you have been a kick scooter enthusiastic from the childhood, then Micro scooters are just for you. It is another synonym of ‘comfort’. Don’t get shocked by the high price, because, once you ride it, you will realize the price worth it. Every part of Micro scooter is made and placed to give you the most comfortable ride. A low deck is combined with large wheels so that you can ride longer with minimum effort. The T bar can be adjusted from 26 to 38 inches; that makes this scooter suitable for medium sized people. Even on the bumpy roads at a high speed, you will barely feel any vibration. Thanks to its shock absorbent handlebars. The kickstand is patented so that you can use it from two sides. There are two colors available of this model, black and white. The white one looks elegant but the black one will get fewer spots over time. The choice is yours! Handlebars range: 31.5" to 40.9" inches. 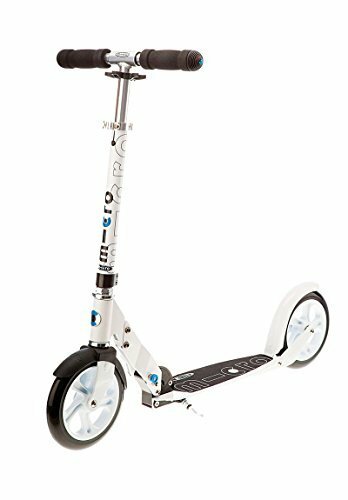 Though Miawheel kick scooters get mixed reviews online, we placed it in our list due to its committed customer service. 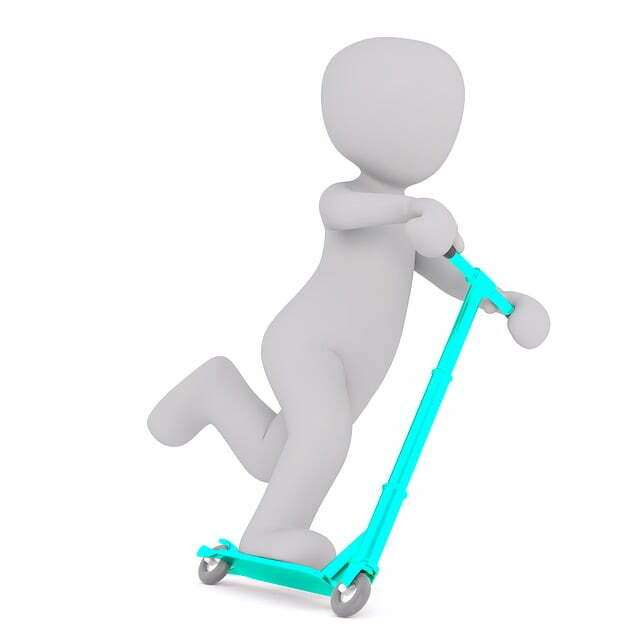 There are possibilities that the scooter may not work properly or does not arrive with all accessories with it, but you can always get a replacement from Miawheels. This model has four colors electric green, red, light grey and dark grey. The green one stands out from others. The range of handlebar is quite impressive, convenient for taller teens. The weight capacity is also very high as per the advertisement (300 lbs) but I suggest not to invest in it if you are more than 180 lbs. The scooter has all basic features of a kick scooter, but the quality is compromised here to make this item affordable. The wheels are urethane made, that may not last as long as PU wheels. Besides, it is lacking the solid and sturdy feel of pricey kick scooters. For the price, it can be neglected if the scooter is used lightly or occasionally. Not recommended for a heavy rider. The main reason we decided to put this brand on our list is, due to its reputation on clean and safe manufacturing. The products Vokul manufactured are produced by the environment-friendly manner and the scoters are certified by CE and GS government safety standards. Otherwise, it is a decent kick scooter available in affordable range. The handlebar range is the highest in our list, so it is totally perfect for taller kids and adults (145-185cm) with longer legs. But the weight capacity is not very high, so, it should be suitable for a lean and tall person only. The attached wheels are not too big, just the size of other regular scooters but these are high-quality PU wheels that remain indifferent to abrasive surfaces like asphalt. It takes only a second to fold the kick scooter. That makes this scooter a must have for people on the go. 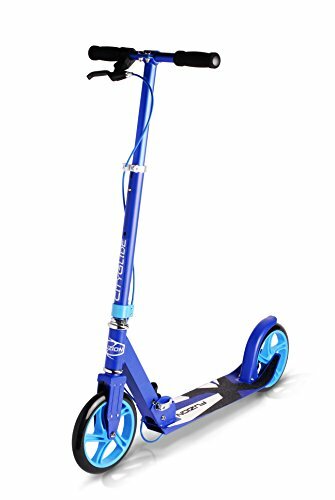 Kids and teens usually pick their first kick scooter based on how cool it looks. But for adults, ease of riding, comfort, sturdiness all matters. Hence, choosing one with all these benefits becomes difficult. This scooter from Playshion may not make an impression to your peer group but it will definitely win your heart after you ride on it. 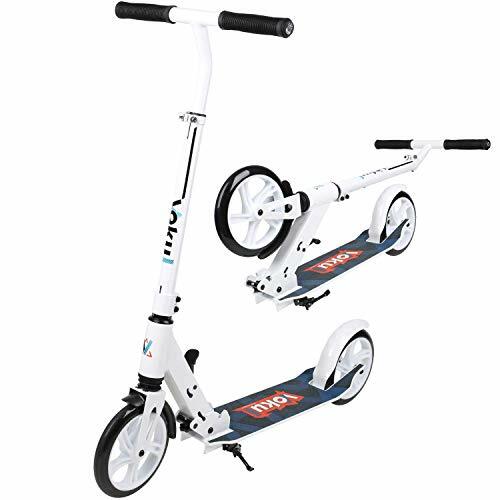 Folding and unfolding of kick scooter are claimed to be easy by all manufacturers and it is not different for Playshion kick scooters. But what makes it better than others is its disk brake on rear wheel and suspension on both wheels. These altogether maker riding a fun, not stress. 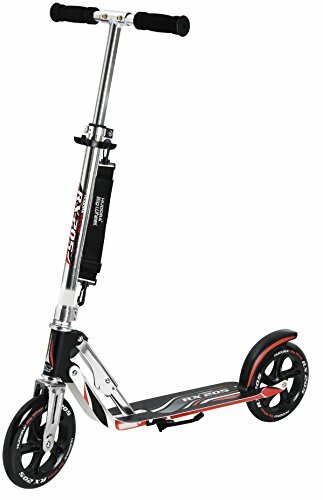 For an easily controllable kick scooter, this one would definitely be a wise buy. Because the price is surprisingly lower than some widely used brands whilst the brake and other gears are better in this scooter. 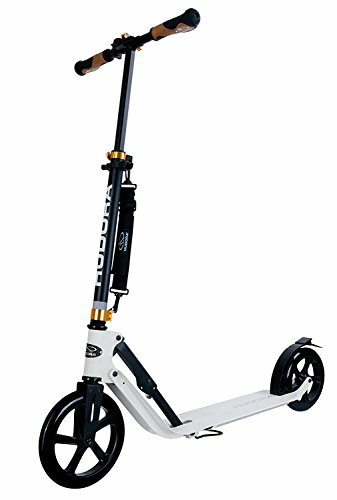 Here is another kick scooter from Fuizon City Glide series. This one does not have that handle break from the B200 model, hence it is much cheaper than that but more unsafe too. It comes with limited weight and length capacity. The advertisement approves this scooter for people with size 12 shoe but I disagree with that. I don’t recommend this one for people more than 165 lbs because it is a bit small for adults. The positive thing is, it is lighter than most scooters, keeping in mind that big kids and teens will be its potential rider. This scooter is protected by warranty and money back guarantee for a short term period, but I doubt anyone really need to use those options. Because, it may come in a smaller size, but the quality is satisfactory. I suggest practicing a lot before hitting the main road with this scooter as it takes time to master the skill of brake. It is available in four colors-black, red, green and yellow. The deck is textured for a secured grip, but that causes peeling off the stain on deck. A dark color may not look as bad afterward. Makes a little noise on a rough surface. Deck Dimension: 33 x 11.5 cm. Hudora is a trustworthy brand who makes reliable wheeled gears for over a decade. This scooter comes with limited weight capacity which may a lot of people hinder from buying this scooter. 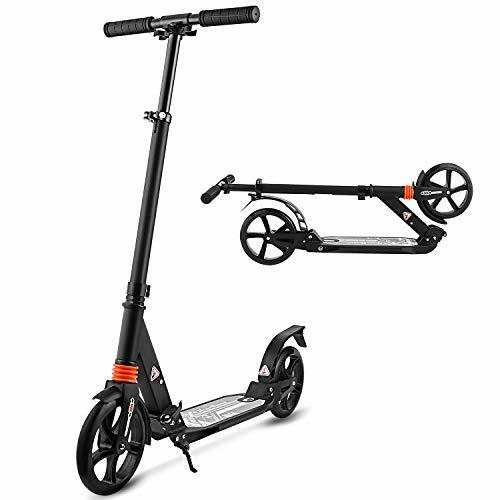 But the strong and solid frame, durable and ergonomic construction makes parents pay for this kick scooter for their teens and kids. The t bar has three settings to adjust and the adjustment is super easy. It uses friction brake on its rear wheel. The scooter is very light when folded and can be stored or hide almost anywhere out of sight. Comes with three colors: black-red, black-turquoise and black-green. The price is almost twice compared to the widely used scooters, but the solid feel it gives while riding is incomparable. Deck Dimension: 18" * 5.5" cm. You may never hear of this brand, but you won’t need to know about any other brands once you get used to this kick scooter. Most of the time the paint peels or rusts off even from the famous and popular branded scooters after years of use. But Hikole has been careful about the paint on their bikes with every other tiny detail. The paint is claimed to be anti-rust so that your kids won’t have any issue with their old scooter after they grow up. The handlebar comes with adjustment features so that you can teach your child how to ride and can enjoy riding together at the weekends. This may plant the unforgettable memory of family bonding to your child. This scooter comes with a bag, which is very convenient for me to keep this clean when not in use. The price seemed low to me considering the quality of this scooter. A kick scooter is a push scooter or human-powered vehicle with a deck for standing, handlebar and wheels that is run by a rider pushing off the ground. And this is the reason it is named like this! Some kick scooters are designed for children with 3 or 4 wheels and made of plastic. Most of the people will imagine a children’s toy by the name. But it can be the perfect way of transport for adults for commuting to school, around the neighborhood or even for work in urban areas. For adults, the scooters are made with aluminum, steel, ply or titanium. So, kick scooter is a mode of transportation that is used by kids to grown-ups to move around to the destination faster than your feet. If you want to buy a kick scooter for commuting, you may wonder which one will be the best! Or how can you choose the right kick scooter for money! Well, this is the very first question everyone will think about. Because you’ll find a ton of options for buying. And it is a little bit tough to select the right one for you from a number of variations. You should select the perfect one for you very carefully. And for making the selection process easy, I’ve summed up some important information for you. The size- for an adult the length and width of the deck must be wider so that you can keep your both feet on it. The strength- the deck must be strong enough to carry the rider. So look for the maximum weight limit of the deck mentioned on the pack. Wheels are considered the most important part of a kick scooter. Because it takes whole pressure of you and the scooter. They always stay in touch of the ground. So you must check the durability of the wheels. Generally, larger wheels are more durable than smaller wheels. They also can absorb the shocks of the bumpy road. So you can ride comfortably on the scooter. To me, wheels with 200-millimeter diameter are perfect for a faster and comfortable ride and they are also long-lasting. Handlebar is another crucial part of a kick scooter because it is the place where you put your hands while pushing the scooter. It helps you to keep the balance properly. So you need to check the height of the handlebar before buying. Generally, 36- 43 inches height is considered as standard height for an adult. But for individuals, if the handlebar reaches your waist, it is perfect for you. It would be more convenient if you get the one with adjustable handlebar so that you can adjust the height according to your height. Generally kick scooters are designed with a brake on the back wheels. But nowadays some scooters are designed with the brake lever on its handlebar like a bike. This brake is connected to the back wheels for safe stopping. You can choose a scooter with any type of brake you feel comfortable with. But for me, modern design is more convenient as I don’t have to look back to find the brakes. Suspension of a kick scooter is the spring-like mechanism that is attached to front or back of the scooter. The purpose of the suspension is to absorb the shock or vibration in your hand and fee while riding. Though it makes your riding experience comfortable but it increases the weight of the scooter. So pick a kick scooter with suspension if you have to ride through rough roads frequently. If you’re going to use your kick scooter for commuting every day, go for the lighter one. That type of scooter will be easier to carry regularly. For regular use, the weight of the scooter should not cross the limit of 10- 12 pounds. Folding kick scooters are the most convenient for riders. Because you may not find the proper parking place for your scooter. So if you have a folding one, you can fold it and carry with you easily. You’ll find 2 types of the folding mechanism in recent days, one is three action and the single action. In three action method, you need to release the clamp then move the pin and lastly secure the clamp in place. In single action folding mechanism, you only need to move the pin where you need to without working with the clamp. So you can choose any them with which you are comfortable with. Having a kick scooter with kickstand can add extra value to it. Because it can give you more flexibility for parking. If your scooter has a kick stand, you don’t need to lay it down on the ground rather you can lower the stand and park it like a bike. Q: Do I need tools to assemble it? Ans: Generally, scooters are pre- assembled. So you don’t need any tools. But it is better to double check before buying that does the scooter requires assembling before riding or not. If yes, check the instruction. Q: How much weight can a scooter support? Ans: It really depends on the specific scooter. You need to check the item detail before buying. Specially the material as aluminum is thinner and lightweight metal, it can’t support too much weight. But most scooters are capable to support near 220 pounds. Q: Can I use it in rain? Ans: Though scooters are mostly water resistant it shouldn’t be wise to ride on a rainy day or on wet grounds. Because the wheels may not give you the support to roll on the wet road. But if you need to ride on a wet surface, must be cautious and wear proper safeguards and most importantly ride slower than usual. Q: Can I do stunts with my scooter? Ans: You’ll find some scooters made for performing stunts but not all. If you’re planning to do stunts look for that type of scooters or you’ll end up breaking your scooter on the first jump. So that is all you need to know before buying a kick scooter for commuting. Hope this buying guide will help you to pick the right one for you. If you go through the features of a scooter, you’ll be able to understand what type of scooter you need. After that, you can also check out the scooter list I’ve provided above! All of them are top rated kick scooters on the market. Check the specifications and grab the one that suits you and enjoy!